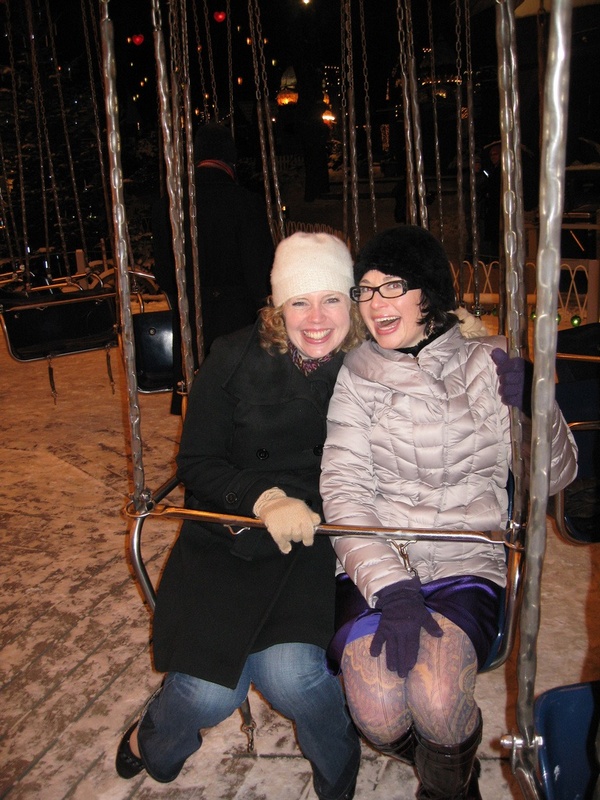 Celebrating the big 4-0 in Copenhagen in December 2009. Thursday at Biker Barre, one of my new spin sisters mentioned that she had created a list of 40 things to do by her 40th birthday. I like a good challenge (as we all know) and I like birthdays even more (as we also all know) so while my birthday is a mere 140 days away, I have spent a great deal of time coming up with items to put on my own 43 by 43 list. 1. Spend my birthday not in DC. This one should be easy since I have tentative plans to be in Hawaii, but you never know what shenanigans by a lame duck Congress might tether me to my desk. I haven’t managed to be out of town on my birthday since the epic 4-0 celebration in Copenhagen, so I think it’s about time to make a December beltway escape. 2. Roast a duck. For years I have been saying that I’m going to cook a duck. This fall, I’m doing it. And I’m going to serve it with a nice Chateauneuf du Pape. Inquire within if you would like to come over for dinner that night (or shoot me the honored duck). 4. Launch in an official capacity Cloakroom Style, my new side business that I am finally positioned to get off the ground. It won’t replace my day job, but if I can beautify Capitol Hill, and in the process, earn extra shoe money, I will consider myself a huge success. 5. Take the boys to a city they have never visited. The obvious choice is New York City, so Colin and Jack (but Colin, especially) can finally see all 1250 feet of the Empire State Building. Those are five rather significant goals, so the remaining 38 will have to include such pledges as don’t overreact as frequently, pick up items from the dry cleaners on time, and think before speaking (or emailing). Not that those challenges aren’t as meaningful, but they are easily (i.e. subjectively) measurable (by me) and do not require as much planning, cash or creative energy. Except the think before speaking/emailing part. That’s going to require some serious concentration. Here it is. 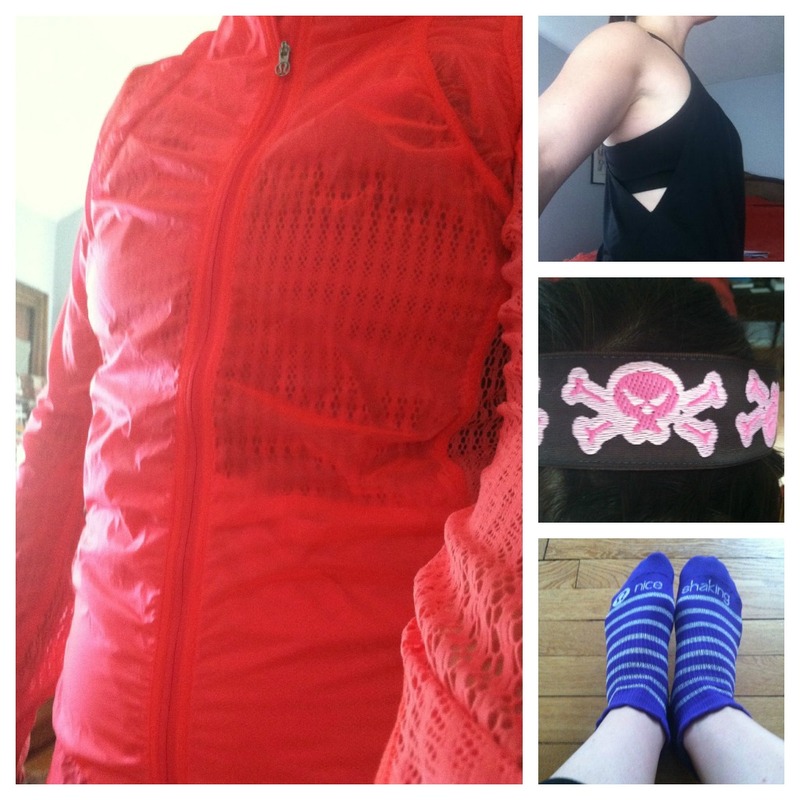 A compilation of what I decided to wear to my spin+spin+barre workout at Biker Barre today. To the left is a great to and from the gym jacket, or in today’s case, what I wore to recovery breakfast with spin sister Monica of Blue Print for Style in the air conditioned Ted’s Bulletin so that I wouldn’t freeze from my sweaty workout clothes. For the workout itself, the No Limits Tank from Lululemon provided the support, freedom and inspiration I needed for today’s mental and physical challenge. What two hour and 45 minute workout would be complete without a Sweaty Band to keep your hair out of your face? That mine has pink skull and crossbones on it just makes it more cutely fierce. I swear, it doesn’t move out of position at all. And barre socks are totally a must for me. I don’t tuck barefooted. I like that this pair has a little message to remind you that if your legs are shaking, you are doing something right. It all worked so well that I am already signed up for the same adventure next Saturday. Today I had a psychic reading. It had been many years since I consulted the mystical for answers to my burning questions, so when a dear friend offered up the name of the psychic she had been using for 12 years, I didn’t hesitate to schedule a phone session with him. After wrestling with a good 20 minutes with the Western Union website so I could pay him in advance, I finally made our scheduled call. We didn’t exactly start off on the right foot. He immediately took my full name and started to make some numerology calculations based on that name. As it turns out, my entire name is cursed. Majesty: Your middle name is Ingrid? You have to lose that. It’s a negative name. Just go to the records office and have them take it off your birth certificate. Me: But I’m named for my aunt. Majesty: And your first name? It’s a beautiful disaster. You need to lose the “a” at the end of Chelsea so I recommend you change the spelling. Me: But I have spent years mocking people who make up alternate spellings for my name. Majesty: If you lose the “a” and spell your name Chelse, you will have total protection your entire life. Majesty: But the worst is Henderson. This name means divorce. Everyone with this name gets a divorce. Why did you take it back after your own divorce? You need to take the name of your second husband, if he even ever marries you because I’m afraid the negative energy of your name might prevent that from happening. You need to change it to Hunderson. Me: So I should change my name from Chelsea Henderson to Chelse Hunderson? 1. I am quite fertile. In fact, I have a third son I haven’t given birth to who is really pissed off that I have not let him be born yet. 2. I need to stop worrying about crap because everything is going to be fine. 3. I will get married again and will get pregnant and release baby #3, but in the Jamaican way, pregnant first, then married. 4. I will build my dream home. 5. I should start my own business immediately because I will be very successful at it and will rise to a high station in life. 6. I have artistic powers and should try writing a book because it will be a best seller. 7. I have met my soulmate and should have no fear, there are great and mighty days to come. 10. I should make things happen instead of waiting for them to happen. As the tarot card reading consumed much more time than the numerology portion of our call, I was able to abandon the despair at my name and absorb his insight. Which at this point really centered around one recurring word: fertile. Majesty: In fact, I think you should change your middle name to Myrtle. Apparently, it’s less cursed than Ingrid. Wow, my J. 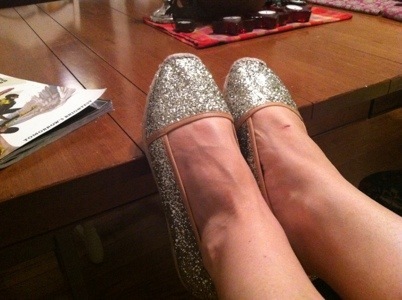 Crew sale on the sale box arrived today and these very casual shoes scream disco ball. In fact, they remind me greatly of a pair of pants (yes, pants) a few of us once saw at Mumm on a man (obviously European) we dubbed Disco Stu. 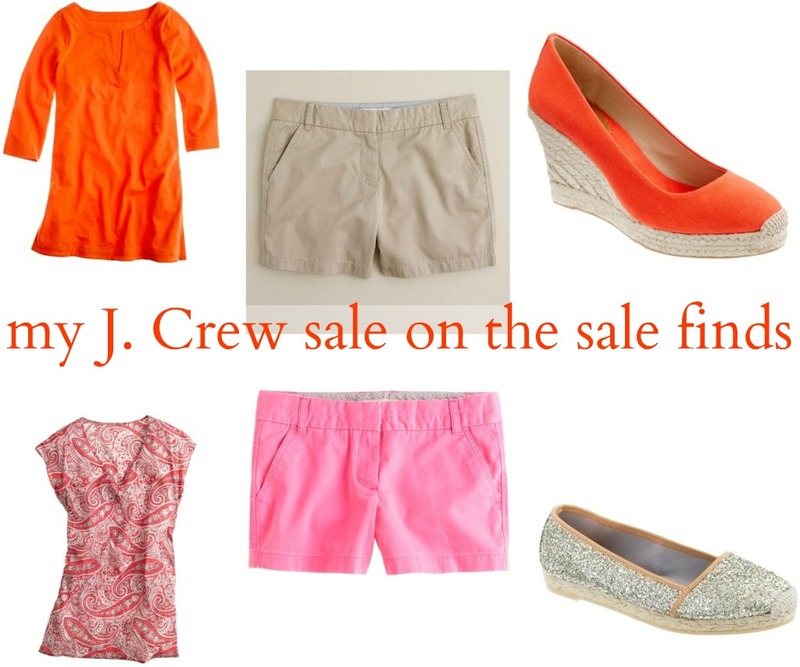 In January and July of each year, SimplySoles holds its three-week Jubilee sale. A gambler’s sale, the way it works is the first week, select items are 30% off, the second week they are 40% off and the third week, remaining items are between 50-80% off. It’s a great way to score an investment shoe at Nine West prices, unless of course, you are cursed with the ever-so-common size 8 foot like I am, in which case your dream shoe is almost always sold out by the third week. Usually my approach to Jubilee is to roll the dice the first week of the sale under the premise that if the item(s) I covet is still available the second week, then it was meant to be. Rarely do I risk the third week, though in January I did wait and scored the Stuart Weitzman Tango for a mere $67.00. My friend Adrienne is more daring than I am. She waits until the last week and more often than not, ends up with shoes by Bettye Muller, Butter and Dana Davis at highway robbery prices. But this July’s sale, her patience paid off greater than normal dividends. In fact, she said she feels like she’s stealing shoes from Kassie by getting the deals that she got. The catch is that Adrienne can afford to wait. She has a size 11 foot. By her own observation, many of the shoes she picked up in this week’s haul were the last remaining shoe of that style. Thus they were marked down the entire 80%. She didn’t have to worry (like I do) about the little “1 remaining!” alert next to the sale price because of her confidence that not a lot of other size 11s are out there competing with her. As such, on Tuesday, the beginning of the third week of Jubilee, she bought six pairs of shoes. The original price of all would have totaled $1062.00. But when you calculate the sale price and subtract the $50 “sole saver reward” she used, her total came to $242. That’s over $800 in savings! So next time you large-footed friends of mine lament your shoe size, I’m going to remind you of Adrienne and the benefit of sales that us average-footed women never get near. I would posture that savings like this is worth the few hundred water ski jokes you’ve had to endure over time. We all get stuck in the rut of our lives. We set our alarm for the same time every morning. We perform the same workout. We eat the same breakfast. We wear the same outfits, have our same conference calls and attend the same meetings. We order the same foods at the same restaurants and we shop at the same stores. We come home at night, and if we are single mommies who work full time, we make the same dinners. Those same dinners, of course, being the ones we know we can prepare fast and, more importantly, our kids will eat. But this week, when compiling my grocery list, I rejected the menu that has become our usual. After all, what a waste to have kids with a somewhat adventurous palate if you aren’t going to push buttons. And since I’m working from home this week – a camp-less week that had been designated for vacation time with mommy until I was overtaken by events and failed to plan anything that qualifies as away fun – I feel like I need to do something to make it interesting. So in addition to daily swim lessons (“why do we need swim lessons when we know how to swim?”) and art class every afternoon (because mommy is working from home, not on vacation) I deemed this “try a new food every day” week. And when I made the grocery list, I consulted my little eaters. Me: Will you eat salmon? Jack: Well, we had it a few years ago at Jaxon’s house and we didn’t like it, but I like going fishing, so maybe we should try eating more fish! Last night, they tried my chili-infused dark chocolate. They liked it. Tonight, we had teriyaki salmon and while Colin complained, he ate nine-tenths of his piece. Jack cleaned his plate. Tomorrow night, we’ll stick with the taco theme, but instead of filling them with beef, we’re having fish tacos. (I’m going to work that “I like fishing” angle as long as I can.) Wednesday night they’re with dad, but Thursday we’re going to see Spiderman, and I already suggested a stop at Oyamel to try grasshopper tacos after the show. We’ll try a new flavor of ice cream (cinnamon) in our maker on Friday and then regroup over the weekend, perhaps visiting the farmers market and picking out some interesting new items together. While we aren’t spending a week on the beach or in Paris or some place exotically educational, we are making our own fun and pushing our limits. But if I’m going to survive the week, they need to stay out of my dark chocolate stash.